Philips Sonicare Essence Sonic Electric Toothbrush This Philips Sonicare Essence electric toothbrush review is intended to help you decide if one of the most popular models in the Sonicare toothbrush line is indeed right for you. Here’s a quick summary of the benefits and drawbacks. If you don’t have a lot of time to spend reading a lengthy Philips Sonicare Essence review, then just quickly flick through these three important questions to get an idea if this model is ideal for your needs. And if you’d like to learn more about the Philips Sonicare Essence electric toothbrush, please go through the detailed review that follows. If you’d like more information about anything related to this electric toothbrush, please let us know in the comments. 1. Is there any serious flaw in the Philips Sonicare Essence? No. This is a fabulous electric toothbrush. There’s little to complain about it, and what are listed as shortcomings in other Philips Sonicare Essence reviews are actually just minor inconveniences, not serious obstacles to buying this toothbrush. Like any other Sonicare brush, the Essence is a great example of what to look for in an electric toothbrush. While this is a basic device without any of the fancy bells-and-whistles of more expensive models, it doesn’t lack any of the necessary elements. You should watch out for special deals that will help you save a bit of cash while purchasing the Philips Sonicare Essence. 2. 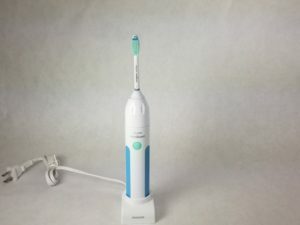 What other models are similar to the Philips Sonicare Essence? The Philips Sonicare 2 Series electric toothbrush range of models and the Sonicare ProtectiveClean 5100 have all the features of the Essence, along with a few more like a pressure sensor. The Oral B Pro 1000 electric toothbrush is another alternative to the Sonicare Essence with all the essential features at an affordable price. 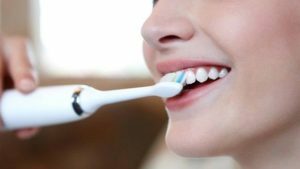 In our Buyer’s Guide to the Best Electric Toothbrush, you’ll learn more about the different features to evaluate while choosing the right one for you. 3. 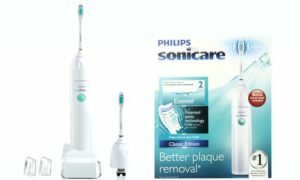 Where is the best place to buy the Philips Sonicare Essence toothbrush? You can pick up this model in offline stores like Walmart, Boots and Target, and get any accessories and spare parts for it as well. It’s also convenient to order the Philips Sonicare Essence from online e-commerce portals like Amazon where you’ll have the extra advantage of discounts and special offers that could help you save some money. At other locations such as pharmacies and convenience stores, you could find this device on sale, but often at a premium price point. These are the 3 most critical concerns before choosing the Philips Sonicare Essence. But there are other elements to consider, too. And you’ll hear all about them in this Philips Sonicare Essence review. So before going on to a more detailed explanation, a word of caution. Why should you even listen to ‘A Dentist’s Daughter’? All electric toothbrush reviews on this site are framed from your perspective as a buyer. After reviewing multiple brands and models of electric toothbrushes, the reviews published on our website are always detailed, thorough and guided by the variables listed in our Buyer’s Guide to the Best Electric Toothbrush. However, we aren’t dentists or dental hygienists ourselves. This isn’t medical advice. You should always go by your dentist’s recommendation while making choices about your oral hygiene. So please check with your dentist before making a final choice – especially if you have any dental problems. Right. Now let’s dive deep into what makes the Philips Sonicare Essence such a popular choice for consumers around the world. The Sonicare Essence from Philips builds upon the technology and design that power the blockbuster success stories of Sonicare 2 series and 3 series electric toothbrushes. Along the way, the company has fixed shortcomings and added extra value to their product. Many users agree that the Philips Sonicare Essence is a great brush that more than meets expectations. What’s more, it even borders on the territory of premium brushes, offering features and benefits that often find a place only in higher-priced models. The Philips Sonicare Essence electric toothbrush delivers a good cleaning experience and is 2 times more effective at removing dental plaque than a manual toothbrush. The adjustable settings make this pleasant and painless. Like other Sonicare toothbrush models, the Essence also has excellent battery life. On a single charge, the battery lasts for 2 weeks of regular use. An automatic inbuilt timer ensures that each brushing session lasts for the full two minutes that most dentists recommend for the best results. While this model lacks a quad-pacer, most users will be able to manage just fine without it. Getting used to the feeling of an electric toothbrush based on Sonic technology can take some time. Easy Start gently accustoms a new user to the experience. By starting out at a lower intensity setting for a few days, and gradually working up to full power by the end of two weeks, it smoothly aids a beginner into being comfortable with the Philips Sonicare Essence. Most electric toothbrushes come with a pressure sensor to indicate when you’re applying excessive pressure on your teeth and gums while cleaning. This function is lacking with the Sonicare Essence. For frequent travellers, the lack of a travel case in the Philips Sonicare Essence package is a drawback. However, there are many third-party products that serve very well for this purpose. The Sonicare Essence has a very typical look and feel to it, with a cylindrical brush handle coupled to a detachable brush head. The handle is white, with a blue strip running along its length. It makes no fashion statement, though, and doesn’t offer a range of colors or customization. The color accent provided by the inset draws attention to the Power button that turns the motor on and off. There are LEDs to indicate the level of brushing intensity, and battery level. A Sonicare logo in grey text is just above the button. The plastic handle is smooth but still manages to offer a secure grip that prevents the toothbrush from accidentally slipping while you use it. The raised dots on the brush handle help create friction that further enhances this effect. The Philips Sonicare Essence may not have the most robust battery life of other brushes in the family, but it is slimmer and weighs less which makes it easier to handle and use. A grey base plate at the bottom rests on the charging stations while you recharge the toothbrush. There’s a tiny recess into which a charging prong fits. The brush can also stand upright on a counter top while not recharging. At the top of the handle is a metal shaft which neatly fits inside the replaceable brush head, conveying the rotatory motion from a motor within the handle to the bristles. One e-Series brush head is included in the package. But if you’d like to change it for one of the other brush heads in the Sonicare line, it can be done quickly and easily by snapping another one on in its place. Several studies have shown that the Philips Sonicare Essence is two times more effective at plaque removal than a manual toothbrush. Cleaning is especially effective along the gum line and in between teeth because of the patented Sonic technology. The brush head is ideally replaced once in every 3 months to avoid wear and tear that reduces cleaning efficiency and might even damage your gums or teeth. If the bristles appear frayed or split, then it is advisable to replace the brush head even earlier. Brush heads have ‘indicator bristles‘ that let you know when its time to replace the head. They are blue in color initially, but fade with use until they are almost white, indicating that the brush head must be changed. The Philips Sonicare Essence is easy to operate. Just press the Power button to turn on the electric toothbrush. As it runs in a single ‘Clean’ mode, there’s nothing to select or change. The timer starts running from the moment you switch the motor on, and indicates at the end of two minutes that the session has ended. The handle turns off automatically. To extend the brushing duration, you must turn it back on again. Most Sonicare toothbrushes offer the quadpacer which kicks in every 30 seconds to let you know its time to move to another quadrant. However this function is lacking in the Philips Sonicare Essence. So you must remember to keep track of the quadrants that you’re cleaning and move the brush around uniformly to ensure adequate brushing of all teeth. Auto-power down functionality helps conserve battery life, and is partly responsible for the decent two-week span of a full recharge. Electric toothbrushes are more powerful than manual brushing. Many users take a while to get used to cleaning with one. Sonicare has included an innovation that helps make this easy, and avoids beginners being scared away! What does Easy Start do? Well, for the first 14 cleaning sessions, the brush motor gradually builds up power. The first time, it is very gentle and gradually, over the next 13 uses, the motor ramps up until it reaches maximum force. Over this time, a first-time user becomes used to the sensations induced by an electric toothbrush. This small touch has made a big difference in many new users preferring to continue with their electric toothbrushes. This isn’t a major concern for most electric toothbrush users, except those who travel frequently and for extended periods of time. For most of us, the only thing that matters is if the battery will last long enough to get the job done. Lithium ion batteries which are now standard with Sonicare electric toothbrush models has extended the life and improved longevity after charging. It is superior to the older Nickel Metal Hydride (NiMH) cells, and doesn’t degrade quickly. The powerful battery means the handle can be slim and lighter than other models without compromising on duration of function. 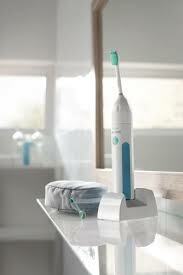 The Philips Sonicare Essence toothbrush will deliver good cleaning effect for two weeks on a full recharge. The automatic power-off function further enhances battery life. Charging it is easy. Just place the brush handle on a charging station that comes along with the purchase, and connect it to a socket. It can take 48 hours for the initial charge and future recharges after the brush is nearly completely drained. Leaving the brush on the station constantly is not a problem, and many people prefer it to avoid the risk of forgetting to charge. The battery level indicator LED tells you how much charge is still left, allowing adequate margin of safety to recharge in time. A yellow light suggests that the charge is down to 10% and that it is time to recharge, while a green light is indicative of a full battery. The Philips Sonicare Essence is a great choice of electric toothbrush for most users. It has everything a basic toothbrush needs, and a little more. You’ll enjoy clean teeth, a bright smile, and better oral hygiene after regular use. Battery life is decent and the price is affordable. The EasyStart function makes it a good choice for even first time users of an electric toothbrush. It’s no wonder that the Philips Sonicare Essence electric toothbrush is one of the most popular favorites on the market today, and that every Philips Sonicare Essence review is a good one. Hopefully you found this analysis helpful in deciding to buy the Philips Sonicare Essence . If you have any further questions or suggestions about it, please leave a comment below.